So, I am headed off to San Diego where (as mentioned before) I will be delivering – at best – an epic Subtopia post on global migration and the architectures of control used to contain it; or, at worst – a massive sequence of overworded sentences and depressing images of border fences and detention halls linked together by sweaty palms and the unpredictable tones of an insatiably dry cotton mouth. Sound fun? Ha! Well, it should be, regardless. So if you are in the neck of the woods this Thursday evening, around 7PM, zip on over to the Woodbury University School of Architecture. It’s all part of their ongoing lecture series -- The Young and the Restless -- that certainly neither starts nor ends with me, so if you can’t make it on the 24th then you still have some time to check out other presentations who’ll be passing through until April. And, just to let you know, my fun doesn’t stop on Thursday. 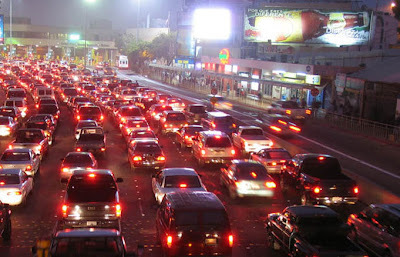 The following evening on Friday I will be popping through the turnstiles at San Ysidro to talk for a bit at Estacion Tijuana, which I guess is just off to the right hand side somewhere once you make your way past the gates into Tijuana. 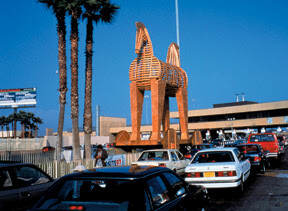 It’s a studio founded by artist Marcos Ramirez ("Erre") who, as you may remember, designed, built and wheeled a 30-foot tall two-headed Trojan Horse (!) up to the border back in ’97 as pat of InSite. I mean, seriously, how sick is that? Got to be one of the coolest border projects I’ve ever heard of, sad to say – ever missed. Anyway, can’t wait to meet everyone down there! Every Thursday evening I’m told the studio hosts events for local artists, while Friday evenings are reserved for non-locals. Sounds like a very cool spot, SO – try to make it Thursday in San Diego if you can, or Tijuana on Friday; or both if you’re that crazy. We love crazy, and we’d love to see you there. Hey, Bryan, you ok? It's been a couple of days since militants blew up the border wall at the Rafah crossing in Gaza to let tens of thousands of people dash into Egypt to get supplies and visit relatives, and there hasn't been a peep about it at Subtopia. Hopefully you're just out of posting range for a while and not feeling ill. We know you would have a lot to say, so post when you get a chance.